ACC hosted the Alpine Century Ride From 2004 through 2013 as a fundraiser for community center operating costs and to help fund the purchase of the facility. The Alpine Century ride did not take place in 2014. In 2015, Alpine Century will not take place. You are invited to ride the Willamette Gran Fondo on August 2 organized by our good friend and neighbor, Mudslinger Events. Willamette Gran Fondo uses a large part of the Alpine Century route, beginning and ending in Philomath. When you register for Willamette Gran Fondo, you can click a link on the registration page to make a contribution that supports Alpine Community Center. Up to $500 of your donations will be matched by Mudslinger Events! In addition, Alpine Community Center volunteers will be among those staffing the Willamette Gran Fondo, resulting in additional donations to the community center. We look at this as a win-win for Mudslinger, Alpine Community Center, and cyclists who love this wild and beautiful ride. The Alpine Century Ride is an opportunity to ride some of Oregon’s wild and scenic beauty on premier NW cycling routes: Alpine Scenic Byway and Lobster Valley Road. Riders are fully supported as they tackle this challenging and beautiful ride. 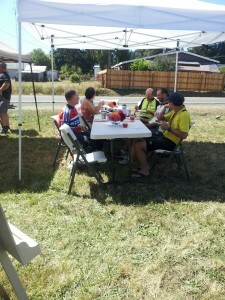 The Alpine Century features well-supplied rest stops and SAG support staffed by friendly local volunteers, HAM radio operators cover areas where cell coverage is weak, and a fresh gourmet lunch featuring locally grown produces awaits at the end of the ride. The 50-mile loop (4000 ft. elevation gain and loss) covers the peaceful and beautiful Bellfountain Rd. and Alsea Scenic Byway, with three rest stops including the favorite at Alsea Falls. The 100-mile route (6000 ft elevation gain and loss) is your chance for a supported ride through the gorgeous and rarely seen Lobster Valley Road. At the Lobster Valley rest stop, choose between an out-and-back return through Lobster Valley or the Highway 34 figure-8 loop. Like the Alpine Century Ride on Facebook.